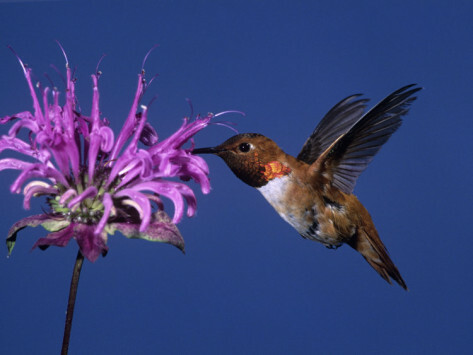 Hummingbirds love sweet,tubular-shaped flowers like those of the Bee Balm herb plant. We absolutely LOVE watching hummingbirds dart through our gardens on a warm Summer evening. Attracting hummingbirds to your garden is a wonderful way to enjoy seeing these fast-flying little birds’ aerial antics up close, and will provide you with hours of entertainment from Spring until Fall. Also a very beneficial garden companion, hummingbirds will eat bugs and help increase pollination in your garden be flitting from bloom to bloom. Hummingbirds do not have a sense of smell, and are instead attracted to brightly colored (usually red), trumpet or tube shaped flowers which their long beaks are specially designed to drink from. Because hummingbirds fly so fast (up to 30 miles per hour! ), they spend most of their time foraging to keep their energy levels high. Their need for fuel is so high that hummingbirds may drink up to eight times their body weight in nectar in a day! We also have a variety of hanging and staked feeders that are specially designed to attract hummingbirds. Made from recycled glass, the colors change from a lovely orange and yellow color to a vibrant flame red that hummingbirds are drawn to. Click here to view our video and watch the hummingbirds swarm these lovely, hand crafted feeders. Place hummingbird feeders near your garden to attract hummingbirds to your plants. Place the feeders at different heights throughout your yard and garden, as some species prefer different feeding patterns. Placing feeders in different parts of your yard will help keep territorial males from dominating all of the nectar. Make sure to keep your feeders clean and full of fresh nectar to ensure that the hummingbirds don’t get sick. Cleaning the sugary substance from the feeder’s holes may also help prevent attracting bees or wasps, as they may convene to find leftovers. Make sure to offer a good, clean water source for the hummingbirds to drink and bathe in, such as a bird bath which is shallow enough for them to play in. Add strings that run the length of your garden, above your plants to give hummers something to perch and rest on while flitting from flower to flower. We had a great time showing James all around the farm- we even sent him home with some potted herb souvenirs! Last week, our good friend, James Farmer came up for a demonstration on garden to table living and while here, he stayed in the cottage on our farm. We had a wonderful time strolling through the test gardens, talking about his favorite culinary herbs for his infamous Southern recipes, and chatting about country life, gardening and everything in between! In the greenhouse, James discovered the benefits of Holy Basil and even helped us pot his very own herb garden kit, the James Farmer’s Favorites Herb Collection, where he includes his favorite culinary herbs for making his delicious drinks and dishes. Our newest herb kit, the James Farmer's Favorites Herb Collection was hand picked by James himself! 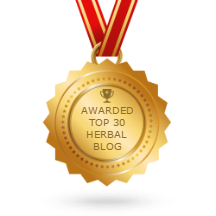 We introduced James to Holy Basil and taught him about its rich history and wonderful medicinal benefits. When walking through the test gardens, we discussed the investment and versatility that perennial herbs lend. 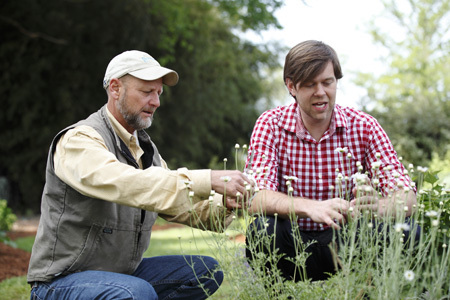 For example, I showed James that more than just a beautiful flower for the garden or in arrangements, Pyrethrum is a natural insect repellent and is used in many organic insecticides. "Pyrethrum is beautiful in the garden or in arrangements, and is also a natural insect repellent used in many organic insecticides." 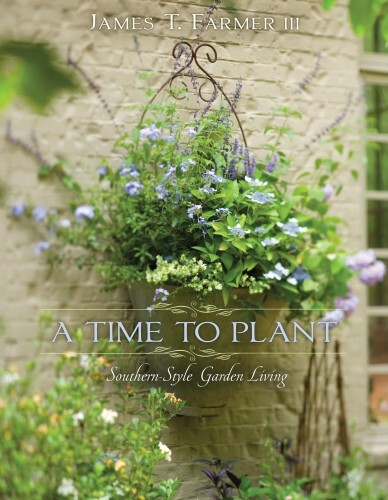 You can purchase James’s book, A Time To Plant: Southern-Style Garden Living and get loads of design tips, recipes and more, AND six of his favorite culinary herbs to create endless concoctions and dishes when you buy the James Farmer’s Favorites Herb Collection and Book! We had such a wonderful time with James on the farm, we can't wait until he comes for another visit! We had a such a fantastic time with James and can’t wait for him to come back! For more information on James, or his newest release, Sip and Savor: Drinks For Party and Porch, please visit his website! What Are James Farmer's Favorite Herbs? We are so excited that our good friend, James Farmer is coming to visit and stay at our farm this week! As part of Virginia’s Historic Garden Week, James is coming to visit and give us an exclusive demonstration on his garden to table arrangements as well as share some of his favorite food and drink recipes from his two books, A Time To Plant: Southern-Style Garden Living, and Sip and Savor, Drinks For Party and Porch, which was just released. James has a wonderful eye for design and has used his talents to bring gardening to a gourmet level. 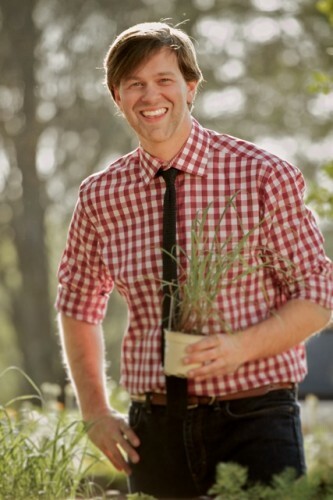 Throughout his elaborate table settings, stunning arrangements and in his Southern-chic food and drink recipes, James incorporates his passion for herb gardening for a refined but “down home” feel. 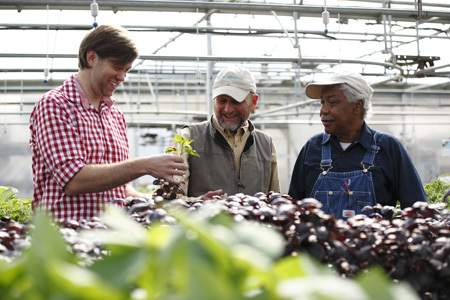 As the most creative new personality in the garden living world, James still stays true to his Southern roots, drawing his inspiration from his family farm in Kathleen, Georgia. To celebrate James’s visit to our farm and his fantastic new book, A Time To Plant, Southern Style Garden Living, we’ve created the James Farmer’s Favorites Herb Collection to offer some of his favorite herb plants! We’ve included Lavender ‘Hidcote’, for its beauty in arrangements or as a garnish, and for its wonderful fragrance and light, floral flavor in drinks and recipes. For a true Southern experience, we added ‘Kentucky Colonel’ Mint, a robust spearmint that grows effortlessly and is the key component to a real Southern tradition, the Mint Julep. ‘Lemon Sweet Dani’ Basil was chosen for its delicate citrus tones and lovely blooming spires, making it perfect for flavoring seafood, salads and garnishing summer desserts. To share a savory note, we also added our Rosemary ‘Arp’, a flavorful, cold hardy, Rosemary that seasons meats, stews and full flavored desserts. (James loves using the Rosemary twigs as skewers for adding fruit kebabs to his delectable drinks!) Rounding out his favorites, are ‘Italian Flat Leaf’ Parsley for its full body flavor and lovely leafy foliage, and ‘English’ Thyme, a classic culinary herb that grew in his grandmother’s kitchen garden and of which he has fond, flavorful memories. 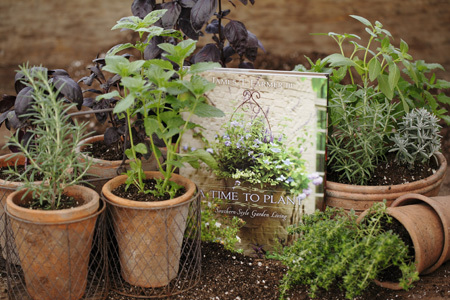 We have even included the option to buy either this collection of six culinary herb plants to get your garden started with Southern style, or the James Farmer’s Favorites Herb Collection AND James’s new book, A Time To Plant, Southern-Style Garden Living, for a lovely added gift. 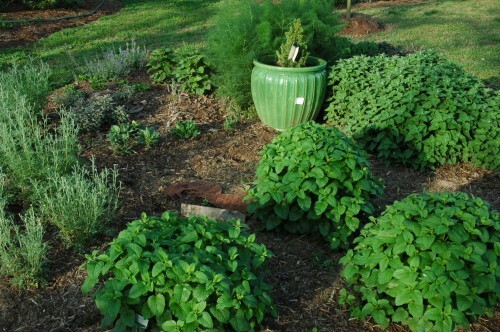 If you may already have these wonderful culinary herbs in your garden, you can purchase A Time To Plant: Southern-Style Garden Living sold separately. Whether you treat yourself or give this as a thoughtful gift, the James Farmer’s Favorites will be a sure delight for entertaining in the garden and in your home! Why Should You Build Your Own Rain Barrel? Rain barrels are easy and very inexpensive to make and you'll save lots of water, time and money. In keeping with our green theme this week for Earth Day on April 22nd, here’s another great project that your plants will appreciate! Our Marketing Director, Caroline and her boyfriend built the one above, for their gardens last summer. Reduce your water use considerably by building a rain barrel. Watering your plants with rainwater is better for them than tap water because of all of the minerals that collect in the rainwater that feed the plants. Also, many municipal water systems treat their water with chlorine and fluoride, which can build up in your soil over time and reduce its quality. Watering your gardens may also use quite a bit of water, and especially in the summer when things are extremely dry, some areas institute mandatory water restrictions. Having your own rain barrel also reduces runoff which can carry lots of pollutants back into the water system, and it allows you to have a source of water in a part of your yard that may not have a spigot nearby. A rain barrel will keep your plants healthy and well watered, save water, and save you money! Building a rain barrel is easy and very cheap if you have the right resources. Start with a large food barrel that you’ve rinsed thoroughly. Place it on top of four cinder blocks that are laying flat on the ground. (This will help to give the barrel more height and better gravity, allowing the water to flow better once it gets to a lower level.) Large restaurants receive shipments of these barrels all of the time, and if you can’t get one directly from them, try looking online. 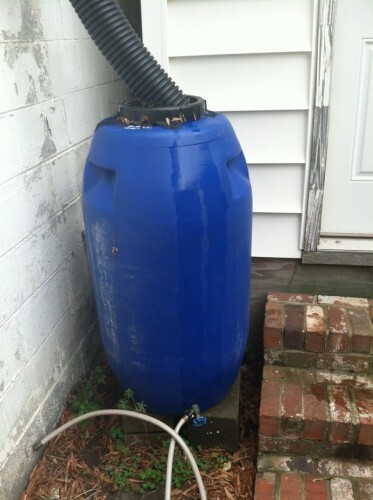 We found the barrel pictured above in a garden listing on Craigslist, and it once held A LOT of olives. Using a Dremmel tool or saw, cut a 6″ hole in the top of the lid, so that the center is hollow but you can still screw the cap onto the top of the barrel. Take a piece of old window screen and cut it so it just fits the top of the barrel, while still allowing you to screw the top in place. Make sure the screen is well fitting, as this will keep insects and debris out of your water. Place beneath or connect to your gutter runoff spout. Then, just wait for it to rain! Your barrel will fill with rainwater and you can water your flowers and herb plants with a watering can or by attaching a short length of hose. 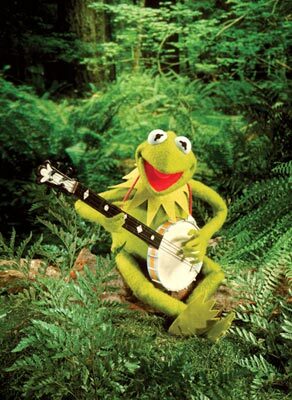 It's actually VERY easy to be green! “Going Green” is a term that’s often used liberally, and rarely followed through. Written off as an advertising catch phrase or something that “hippies” may be worried about, going green is really about sustainability and choosing to treat our planet better. April 22nd is Earth Day and as a gardener, grower and outdoors man, I have a very deep respect for our planet and its natural resources. In sharing a love of gardening and growing plants, I believe we all share the similar belief that we should cherish and preserve the natural gifts that we’re given. 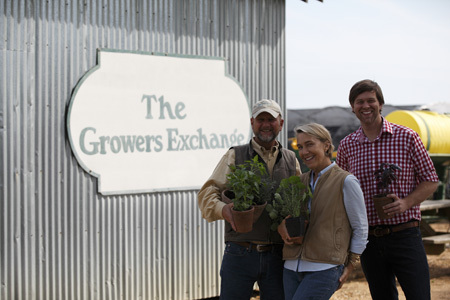 We stay green at The Growers Exchange by composting excess plants and incorporating organic matter from our cattle. We try to use as little packaging as possible when shipping your plants, and the peanuts we use for packing are made of cornstarch and are biodegradable. We grow our flowers and herb plants without the need for high powered commercial insecticides and sprays, instead opting for applications that are plant based. Around our farm we grow warm weather grasses and leave plenty of buffer area between us and the James River to help filter runoff. We replant and replenish trees around our farm after natural disasters blow through (like Hurricane Irene last year) that knock mature trees down. We then used the downed trees to heat our greenhouse this past winter. These are just a handful of the ways we remain a green company in our daily practices. Although we should incorporate more ways to conserve everyday, Earth Day is a great chance to reaffirm those sustainable practices. 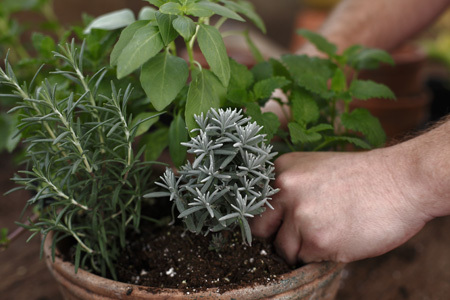 This week, we’ll be sharing gardening tips and ideas on going green. What ways are you gardening sustainably in your own garden and going green in your community? Spring is here and there is nothing more beautiful than looking out at perfectly shaped herb plants, thriving in our test garden. We planted these perennials in our test garden this past Fall and with our mild winter here in zone 7b this year, they’re all well established and growing vigorously. To help cut back on spring chores and to ensure less stress to many of these plants (especially the woody perennials) we pruned them in early February for healthy new foliage this spring. 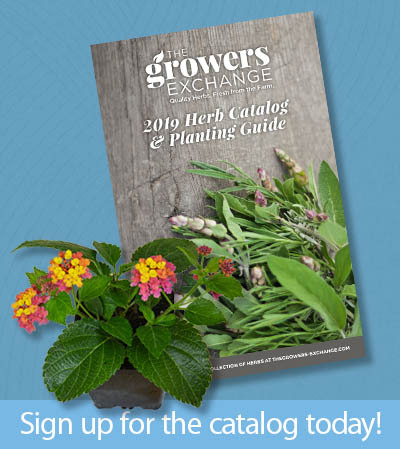 There are different types of pruning methods, depending on the type of herb. Woody perennials, like Rosemary need to be hard pruned while the weather is still cold in early spring, so that it causes the least amount of stress to the plant. Hard pruning means cutting the plant back to the more mature wood, where there is no sign of tender new growth. This directs the plant’s energy to the newly trimmed area to encourage new, lush growth once the temperatures warm. You can prune up to about one third of the plant, and then give it more frequent “haircuts” throughout the rest of the year to keep the foliage nice and green. For a great video on hard pruning your woody perennials, check out our video where I prune the Rosemary ‘Salem’ in our test garden! For leafy herbs like Italian Flat Leaf Parsley, make sure you prune your plant around the outside, leaving the new growth in the middle. As the plant grows, the older foliage gets pushed to the outside, as the tender new leaves emerge in the middle. Once you trim your leafy herbs, you should see vigorous new growth as the plant redirects its energy toward producing new leaves. Here’s a great video on pruning Parsley to give you some inspiration! Pruning can be rather scary for new gardeners, as the thought of cutting the plants you’ve worked so hard to grow can feel a bit like a step in the opposite direction. Don’t worry! Plants appreciate a good spring cleaning and a little trim around the edges to really allow them to flush out as the weather gets warm. 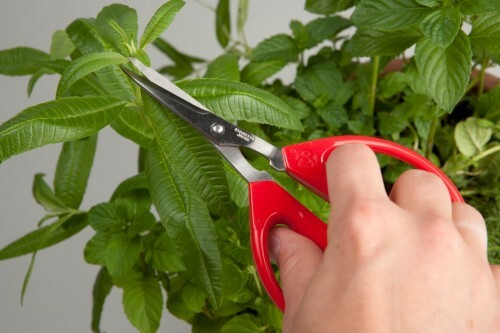 Always make sure to use clean, sharp pruners or scissors for a healthy cut and your plants will bounce back even better than before!